There is no doubt that for a large part of the movie-watching population, jazz flute will instantly call to mind Will Ferrell's heroically unhinged performance on said instrument in a scene from Anchorman: The Legend of Ron Burgundy. That Ferrell is now synonymous with jazz flute in some quarters says something, although I'm not exactly sure what. Regardless, Carlos Jimenez approaches the flute on Arriving in a traditional manner, without a sense of irony. The great danger of playing flute in a jazz setting is that the light breathiness of the instrument can evaporate into the ether, leaving listeners with nothing to hold on to. Luckily, Jimenez solves this problem by ensuring that the music behind him has a heavy percussive base. For the most part, the rhythm section locks into a solid timbal and conga-spiced groove while Jimenez solos freely on top. The contrast between the high and low makes both ends that much more compelling and vivid. Four of these eight tracks feature guest musicians who help keep the sound fresh and evolving. Violinist Lewis Khan's appearance on "Flute & Violin is particularly stimulating. Khan and Jimenez play over a Middle Eastern-tinged melody that is both exotic and alluring. On Miles Davis' "So What incidentally, the only track not composed by JimenezDave Valentin also sits in on flute, with a deeply hypnotic result. Arriving is a fine display of mellow Latin jazz on which the high points outnumber some of the more generic tunes. And, just in case fans of Anchorman may be wondering, the album does not feature a quote from "Aqualung. Track Listing: Tomando Cafe; Flute & Violin; Natalie's Cha Cha Cha; Arriving; Tunnel Of Flowers; My Allison; Que Paso? ; So What. 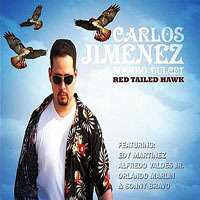 Personnel: Carlos Jimenez: flute; Hilton Ruiz:piano; Guillermo Jimenez: timbales; Geoff Brennan: bass; Aryam Vazquez: congas; Adam Weber: drums; Dave Valentin: flute (8); Bobby Porcelli: alto saxophone (4,6); Lewis Khan: violin (2). Title: Arriving | Year Released: 2005 | Record Label: CJMartinete Music Co.